It had been about a year since the last visit to The Golden State Cafe. On this occasion, Fat Bruce Lee and I brought 3 co-workers to join the fun. I am pleased to announce that the burger was better than the first time that I had sampled it. Co-owner Jason Bernstein was on hand to answer questions and keep a lid on things. It was a real pleasure speaking with someone as knowledgeable about burgers as Jason. He truly understood the importance of starting with the best possible ingredients and letting those ingredients do the work. Price...10 bucks for a burger and fries. Our food was at the table within about 10 minutes. The Beef: They took delivery of Harris Ranch beef from Huntington Meats once or twice a day. The custom beef blend was ground to medium at Huntington Meats, which was about a block away. I observed the kitchen staff form the patties by hand, and I was impressed by the bright redness (freshness) of the product. The Golden State Cafe used a blend of Chuck, Rib-eye, and Rib-eye fat. The beef was wet aged, so it was a little light on the funk. What it was strong on was beef, blood, and mineral notes. The beef was delicious and very satisfying. While the fat content was right around 80%, what we really noticed was the juiciness of the burgers. The Seasoning: The seasoning was dead on. They hit the patties with a generous amount of something salty, and that savoriness carried through the entire bite. It complemented the beef perfectly. The Sear: This was the weak point of the burger. It was delicious, but I really wanted a crunchy sear to deliver a little extra flavor and texture. The lack of sear did not detract from the dish. The burger was damn good without it. The Preparation: The patties were loosely formed by hand and allowed to rest for a few hours, which allowed the proteins to get together just enough to provide a firm bite. 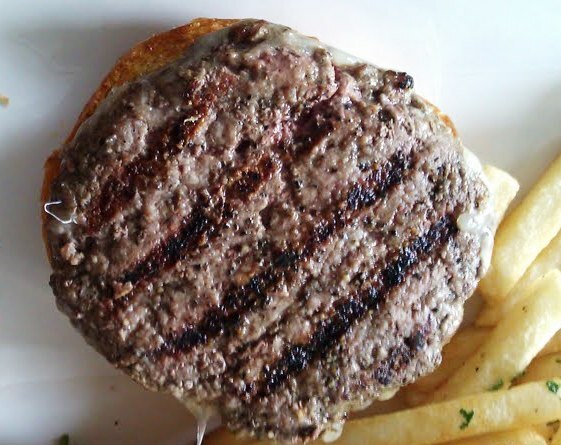 The patties were grilled on a moderately hot, gas grill to a very juicy Med-Rare. Note: Med-Rare was how they prefer to serve cheeseburgers at The Golden State Cafe, and that was just right. The Cheese: This was a salty Fiscalini Farms White Cheddar. It was freshly sliced as we walked in. The cheese provided just a little umami and some additional savory notes to the dish. 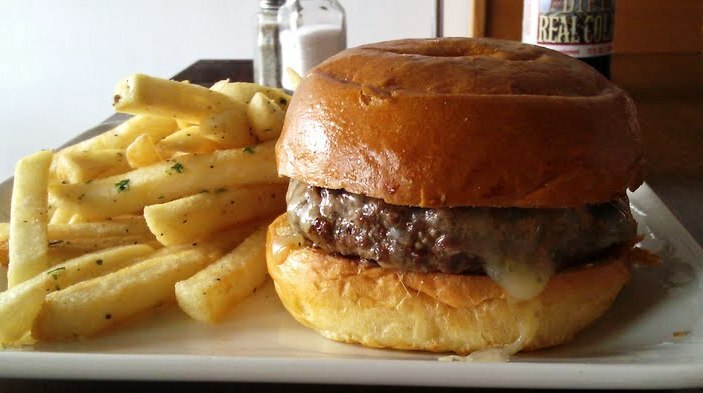 The Bun: They sourced the sweet, buttery brioche buns from Rockenwagner. This bun was excellent. It was just sweet enough to balance out the saltiness of the dish, and just firm enough to save our fingers from being drenched in burger juice. The buns were clearly very fresh, and they were toasted lightly on the griddle adjacent to the small grill. The Fries: The fries were like a thicker version of In-N-Out fries. They did not appear to be par-cooked, so while they were very flavorful, they were not particularly crisp or browned. Still they were nicely seasoned and quite good. The Value: 10 bucks for a nearly perfect burger seemed perfectly reasonable. 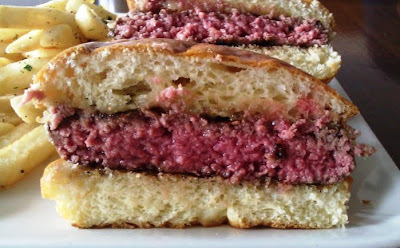 The Golden State Cafe served up a very nearly perfect burger. It was a hit with 5 out of 5 of our dining party. I asked around the table, and everyone agreed that they would recommend this burger to their friends. Burger Review : A nearly perfect cheeseburger. Rating...4.5 Bites...that rounds to 5 Bites.